For a while now I’ve been adding non velcro backed patches to things, but without sewing, or ironing on with the usually included adheasive.. One, I don’t like permanent, and some things you either can’t sew to or heat..
My solution was a roll of industrial strength adheasive backed velcro that I originally bought to apply a holster to the side of a snowmobile gas tank.. think pomelo bag holsters on horse saddles. 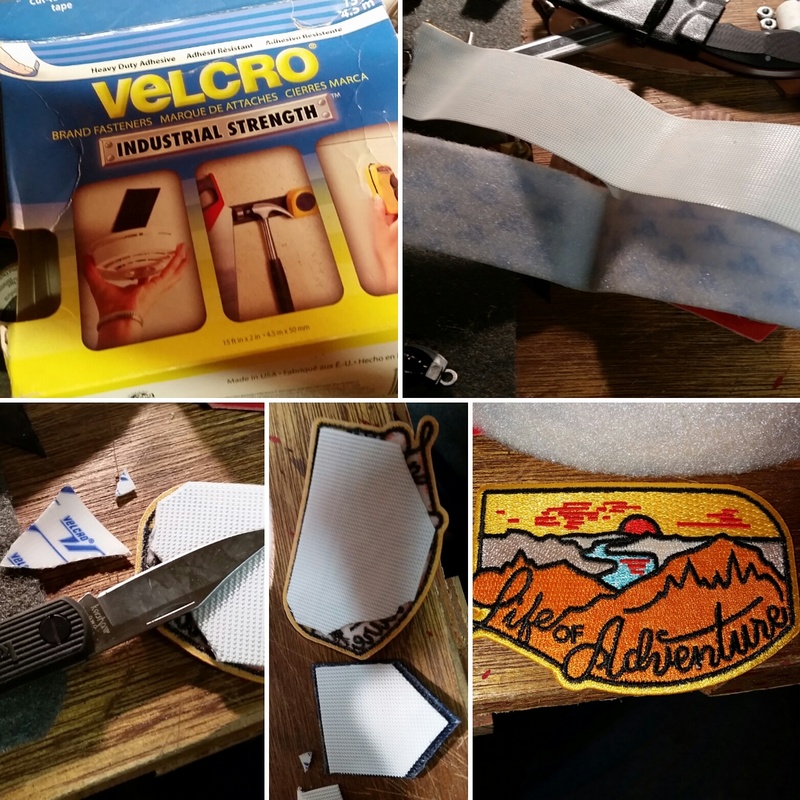 I just cut to shape with a sharp knife (scissors don’t work well at all on it), peel, stick, press with my hands for 30 seconds or so, and use. I’m carefull about removal of stuff using it for the first 24 hours, just to let the glue set good.. it does take a little time for full strength grab but the instant tack really is pretty darned good. I’ve had strips of this stuff holding patches onto my Nook case since late 2012. That sucker has been anywhere and everywhere with me, unprotected by any other case or bag 99% of the time, and I have yet to lose or even loosen a patch, or any of the velcro strips. I’ve also had it on the front of my pocket notebook cover for at least a year, (actually two I think…) Same deal, it’s stayed stuck the whole time. Yesterday I improved a bare Field Notes with a packing tape wrap and a place for a patch. 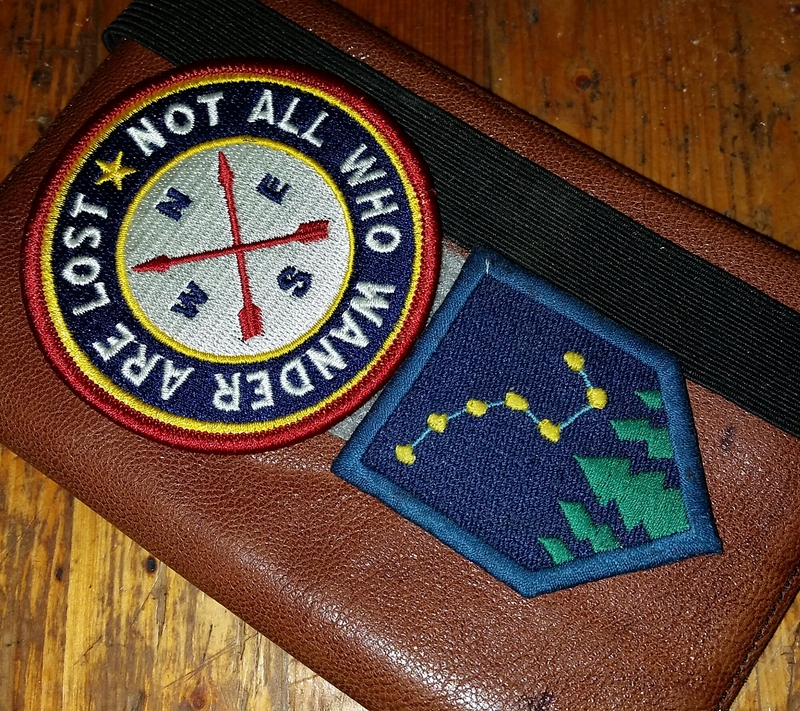 And I also extended the velcro area on my leather notebook cover to take my little Alaska flag like wayfinder patch from @fieldandforestco (on etsy). I really need to get the rest of these little badges that they make, they’re some cool designs! The Tolkien wanderer patch is from ShopRedArrow (also etsy). Leather notebook cover was made by ArtisanGraham on etsy. (Apparently no longer selling there, and I haven’t been able to find him Anywhere else online… )I’ve had it since Oct. 2011 and it’s held up superbly! Really, really well made! I’ve been running it with two Field Notes in it off and on for almost two years now. Love it!